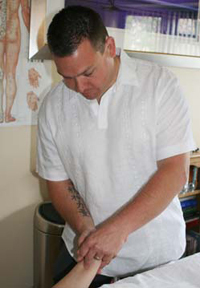 I am an Acupuncturist, Tui Na therapeutic massage and Chinese Dietary therapist in Rochford and a member of the British Acupuncture Council (BAcC) and the UK Register of Tui Na Chinese Massage (UKRTCM). Please feel free to give me a call to talk about any condition not listed below. I have experience in treating many conditions and have a particular interest in Sports Injuries, Mental / Emotional conditions and Women's Health and Fertility. Traditional Chinese medicine originated in China over 3,000 years ago and is based on the Chinese philosophy and Taoist principles that health is dependent on the smooth flow of Qi (energy), which runs through our bodies. Qi circulates through twelve energy lines, known as meridians, within the body and each meridian is associated with a different internal organ system. More and more people are turning to Traditional Chinese Medicine for solutions to their health problems and scientific research is beginning to back up what acupuncturists have known for thousands of years – and that is that Acupuncture works. I am now also available at the Clinic of Complementary Medicine 31 Shenfield Road, Brentwood, Essex CM158AG. Click here to find out more information.